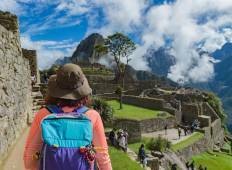 Find the most amazing mountain hikes in Latin America. There are 275 tours to choose from, that range in length from 3 days up to 62 days. The most popular month for these trips is November. "Amazing tour! Jam packed with lots of great activities. Edwind was an amazing guide..."
"Had a great time, Paolo was a great guide. Highly recommended." "The fantastic ice range of the Cordillera Huayhuash is renowned for knife-edged 20,000-foot..."
"An amazing trek! Our guide Edgar was very passionate about the culture and we learned..."
"World Expeditions organized a 20 day tour of Peru for our group of 31. Some were..."
"Fantastic! This is my second trip with OneSeed and they have maintained their high..."
"They were awesome! We were looked after from start to finish. Guide was brilliant!" "Excellent Experience! We thoroughly enjoyed and appreciated the excellent experience..."